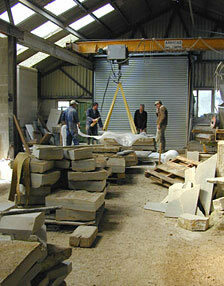 The Purbeck quarries where Tony Viney sources his raw materials, are all to be found within a ten mile square mile of each other on the coast of Dorset, but they produce a wide variety of different stone. Colours range from the blue and green of Purbeck Marble to the golden honey colour of Thornback or the creamy white of the cliff free stone. Most beds have their own highly distinctive fossil structure. Follow the links below for more about the history of stone quarrying in Purbeck, or the Jurassic Coast World Heritage Site, which stretches along the coast of Dorset from Purbeck to Exmouth in Devon.